India had won the first Test in Adelaide by 31 runs to take a 1-0 lead in the four-match series. 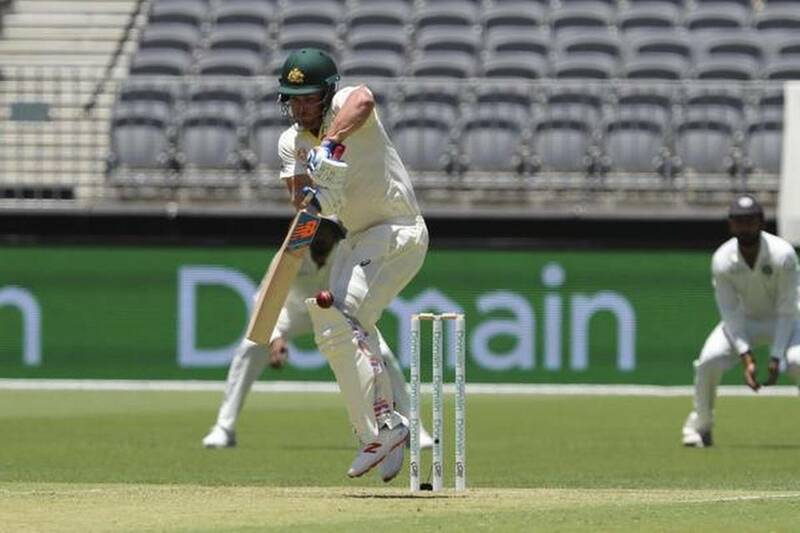 Openers Marcus Harris and Aaron Finch kept the Indian pacers at bay on a green top, taking Australia to 66 for no loss at lunch on day one of the second Test here on Friday. After the session lasting 26 overs, Finch was unbeaten on 28 runs (81 balls), while Harris was on 36 not out (76 balls). This was after the hosts won the toss and opted to bat. Australia named an unchanged eleven from the first Test, while India made two changes. Hanuma Vihari and Umesh Yadav came in for the injured Rohit Sharma and R Ashwin, as India fielded an all-pace attack for only the third time in their Test history. The Perth wicket at the Optus Stadium was talked up a raging green-top wicket, but the Australian openers defied all that speculation. For their part, Indian pacers chipped in with all possible help and bowled a poor first spell with the new ball. Ishant Sharma (0-16) started with a delivery down leg as the first Test ball to be bowled at this ground. It didn t change much for this first spell of four overs as he sprayed the ball all over. He seemed to be more concerned about not bowling any no balls, than maintaining an attacking line first up. At the other end, Jasprit Bumrah (0-26) was bowling short of length, even if he bowled quicker than Ishant. This new ball pairing proved expensive and wasteful as Umesh Yadav (0-19) came on as first change in the ninth over. The Australian opening pair was cruising at this stage with 45 runs coming in the first 11 overs and the hosts went to drinks at 47-0 in the first hour of play. Mohammed Shami (0-4) was India s best bowler of the first session and he bowled with immaculate control from the very beginning. He came on to bowl in the 12th over and immediately troubled the batsmen. His first spell, along with Yadav’s, was key in pulling things back for India. Finch survived an lbw shout on account of height as India wasted a DRS review. They had another loud shout turned down on the very next ball, but this time no review was taken. The opening pair brought up their 50-partnership off 90 balls in the 15th over of the morning. Finch had attacked more in the first hour, but settled down to make it until lunch after Bumrah tested him in the next spell. Harris meanwhile was steady and left the ball well, without playing any false shots. India bowled better in the second hour of play and conceded only 19 runs in 13 overs. All pacers bowled a second spell, as Ishant and Bumrah in particular improved on their initial spells. But the damage had already been done as the duo was set and the new ball had been wasted on a fresh pitch.